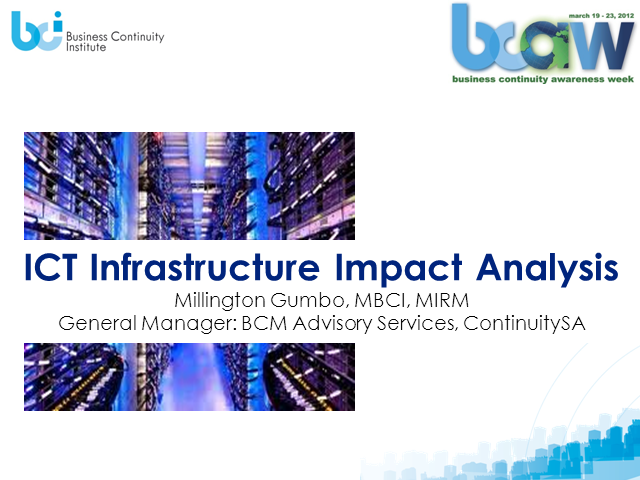 Millington Gumbo (MBCI, MIRM) is the General Manager for the BCM Advisory Services division of ContinuitySA, Africa’s and the Middle East’s leading Business Continuity Management services provider. He has been involved in Risk Management and Business Continuity Management since 1997. He is a qualified risk management practitioner and a Member of the Business Continuity Institute. The ICT Infrastructure Impact Analysis is a ground breaking methodology developed by ContinuitySA designed to facilitate the segmentation of key ICT infrastructure in various tiers of criticality and identify cost effective ways of providing IT Service Continuity solution for each tier. The segmentation process traverses the entire spectrum of IT infrastructure from front end to back-end components. The IIA process harnesses the combined expertise of the CIO, CRO and CFO in ensuring sound investments in hybrid IT Service Continuity and Disaster Recovery solutions which protect profitability and maximise returns for shareholders.